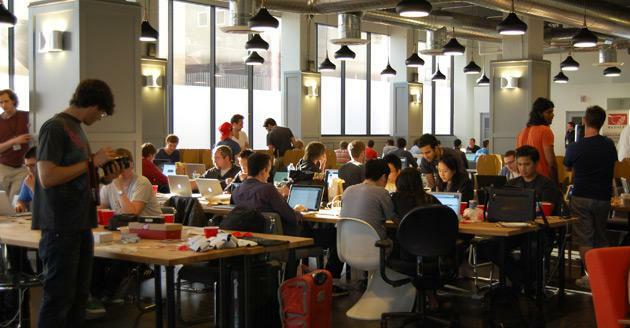 While the San Francisco Bay area may be more widely known for its "hack day" events — where eager coders get together for intense short programming sessions, typically with the over-arcing goal of producing a working product or prototype — Los Angeles is poised to give Silicon Valley a run for its money. 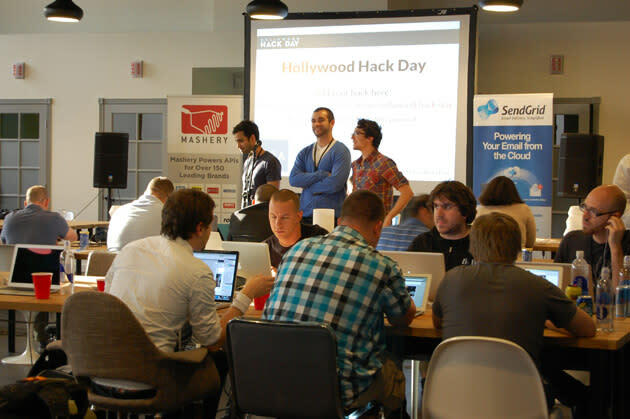 This weekend marked the second Hollywood Hack Day event, where developers and designers from primarily the greater LA area (but from as far afield as Chandler, Arizona) came together at the io/LA co-working and startup incubator space to create innovative entertainment applications over the course of 48 hours. We saw a rather impressive slate of 22 projects presented at the end of the 2-day program, an assortment that organizer Ryan Chisholm happily considered "higher quality" than the inaugural Hollywood Hack Day held in early November. By day a music manager at Bill Silva Entertainment, Chisholm and co-organizers Abe Burns (digital operations for Madonna manager Guy Oseary) and Rahim Sonawalla (Product Manager at Rovi, makers of one of the popular APIs in use at the event), pictured below, would love to see the event continue to grow and attract entrepreneurial souls interested in using technology to create new entertainment experiences. 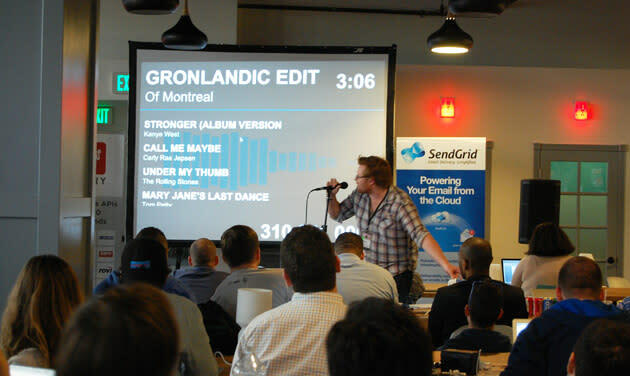 Among the highlights of the projects, the top 3 of which took home $2000, $1000, and $500 prizes respectively, were applications like Social Jukebox (2nd place) that provides a way for patrons at a bar or attendees at a party to send text messages to queue up the songs they want to hear — think crowdsourced DJing, with additional text commands to get more information about a song or even buy the currently playing track on Amazon. Incorporating the Tumblr API publishes a log of all the tracks played that night for later reference. Another project dubbed "It's On!" provides an online interface for celebrities to interact with fans via video and text-based chat, while also automatically notifying their fanbase via email, SMS, or phone that they're currently hosting a session. Project popify.us, winner of the Rovi sponsor prize, generates an automatic playlist of music videos based on a simple artist search by making use of last.fm's API to pull in related items and quickly start rolling some audiovisuals. Billed as an "interactive, visually-stimulating music experience for parties or events," the software gives participants a way to comment on the currently playing video via text message or vote on which music videos should come next from the upcoming queue. What makes developing such compelling products in such a short time span possible is the use of coder tools called Application Programming Interfaces or APIs — "hooks" into large stores of data like the music catalogues of popular streaming services Spotify or Rdio that those companies offer for the express purpose of allowing other developers to build interesting projects on top of their services. As sponsors of the event, those companies among others including Tokbox, Twilio, Mashery and more had representatives on hand to help the participants get the best use of their products. Participating programmer Eva Zheng listed access to that kind of invaluable knowledge base as one of the highlights of participating in the event: "having people here from all the major APIs was amazing, and nobody ever said, 'not now, I'm working.'" She portrayed the event atmosphere as highly collaborative, with participants and sponsors eager to help each other out however possible. Undoubtedly one of the youngest programmers in attendance as a mere junior in high school, Zheng was also one of the relatively few women participating in the event — a gender dynamic she hopes to be a part of helping to change. Her project CelePedia, built with a (male) co-collaborator, is a website for fans of celebrities to get information including top facts, photos, and latest tweets in one place along with the ability to drop in and text or video chat with other fans in one unified environment. Organizer Rahim Sonawalla said although they're not promoting any particular end goal for the projects created at Hollywood Hack Day, at least one participant was hired as a direct result of the previous event, while food sponsor Chipotle expressed interest in one of the applications created for use in its stores. Participation from an entrepreneurially star-studded panel of judges including Jeff Solomon, co-founder of Amplify, and Aber Whitcomb, co-founder of io/LA (and former co-founder and CTO of MySpace) provide a real opportunity for coders to get an idea seen by people who might be able to help them take it to the next level. Pleased with the relative growth, Sonawalla noted about a 50% increase in turnout over the previous Hack Day, to over 100 participating coders. What's next for the event? "We would love to take it to New York or San Francisco — it doesn't just have to be located physically in Hollywood," he said. The three organizers are also considering how often it makes sense to hold the event in Los Angeles, but interested coders, designers, and entrepreneurs should expect another opportunity to get their hack on in LA in the next six months or so.